My first trips to Paris were podiatric disasters. Shoes I'd proudly worn ten years disintegrated as I realized how sedentary Cleveland life was. Turns out, pillows made of marshmallow clouds and rainbows hurt after walking here to Chateau-Rouge in them. Figuring out what shoes worked best in the city took a lot of trial and error, limping around the flat, and wasted money, but now it's down to a science and will hopefully spare you harried shopping trips and hallux abducto valgus deformities. Note: These tips are for leather shoes. Sorry not sorry, I don't have any synthetics. 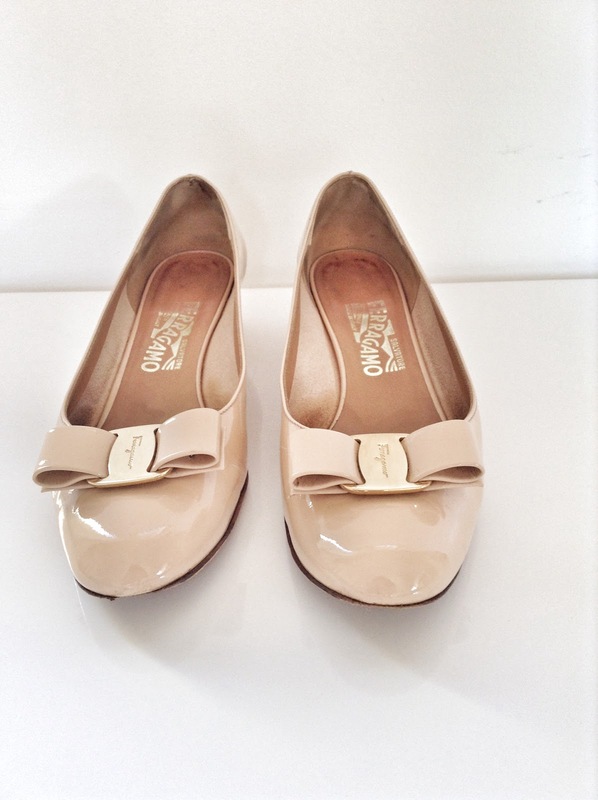 Leather breathes, keeps feet cool, and softens with every wear. After a few uses, leather soles have great traction. Brush a small amount of beeswax and a few drops of lanolin, jojoba, or olive oil onto shoes to make them water and stain repellent. Olive oil is often shredded by internet trolls, but leather experts recommend it. It's an ingredient in many shoe creams and won't breed mold when used properly. Buff with a soft, lint-free cloth (like a flour sack towel). White vinegar removes salt stains, dirt, and grime from all types of shoes. Use one part water and one part white vinegar to discourage mold. To restore suede, apply vinegar-water solution using a natural bristle brush (any clean scrubber will do). Gently brush suede in various directions to scrub dirt from fibers. Use a piece of bread or art gum eraser to remove stains. Wipe insoles lightly with white vinegar and dry (preferably in the sun) to deodorize. Alternately, leave orange peels, clove buds, or baking soda in shoes overnight. Paris shops heat-stretch their own shoes (even secondhand pairs) for free. Rub beeswax around the insides to soften and lessen their bite. It sounds counterintuitive, but stockings and low-cut socks enhance comfort and prevent blisters. I wear Swedish Stockings; one French option is Cervin, which are plastic-free but not vegan- 100% silk, produced in Sumène, readily available secondhand in Paris (they boil the worms). During colder months, I wear no-show socks over stockings. They keep feet dry and are invisible in heels. 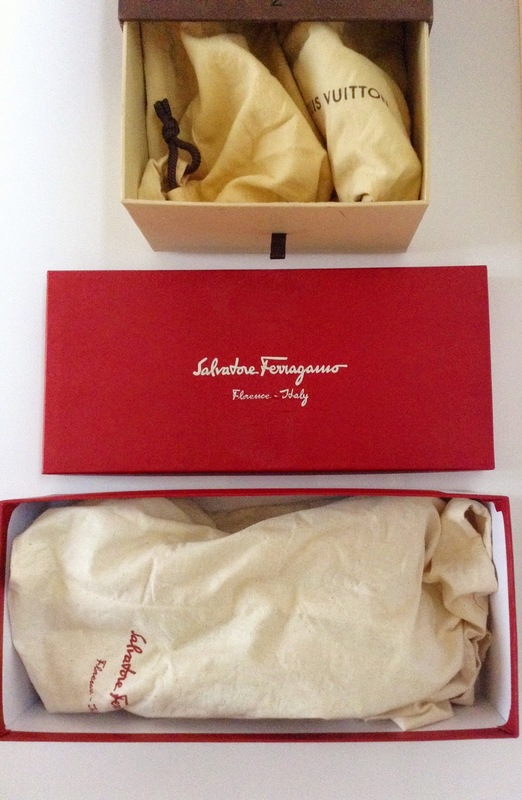 Store shoes in dust bags in their original boxes. Some boxes come with polaroids stuck on them, which is demeaning. If you need a photo to remind you what's inside, you have too many shoes. Plastic shoe trees and boxes encourage mildew and mold; unvarnished cedar shoe trees absorb moisture and prevent leather from cracking. The prettiest are 36€ at BHV (BHV is the worst, but cordonneries tend to carry ugly, expensive embauchoirs). 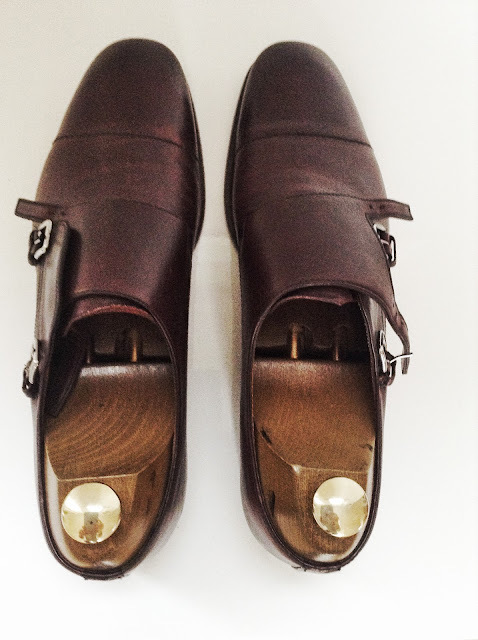 For shoes worth over $200, get the kind with ventilation slots and brass knobs. For shoes worth over $700, use lasted shoe trees. Hi Sarah! Thank you so much for your nice comment! What is your trench coat made of? I keep my sleeves rolled all the time. It's been years now! I know that with some cotton and linen fabrics, holes form where creases are so a coat like that, I imagine, needs to be unrolled and ironed periodically. My coat is waxed cotton and reinforced where I roll them so it doesn't seem to be a problem. I put beeswax on the soles but not olive oil. I only have one pair with vibrams on it and they only put them on recently and I was kind of mad that they did it. I brought the shoes in (not to my usual cobbler, who was on vacation) to have the heel tips replaced and they added the Vibram which makes it less comfortable, covered up an already perfectly nice leather sole, and according to the manufacturer and my regular cobbler, shortens their life span. Ferragamo says to never put Vibrams on their shoes for the same reason :( I have leather soles on my other shoes and they are perfect for rain and cobbled streets, I actually prefer them to the Vibram for uneven surfaces because they mold to the feet better and once they get scratched, the soles have better traction. Thank you again for your sweet comment! I'm writing a few more posts for next week at the moment. Things are so busy at work because everybody's getting ready to go on vacation and we have so much to finish! But I will post soon! Hi Ariana, thanks for replying so quickly. The trench coat is an old Aquascutum, 55% cotton and 45%polyester (I could have done without the polyester, but there it is). The fabric is pretty heavy. Thanks for the advice regarding the shoes. I shall look forward to reading your new posts! You are so nice :) Ah ok, I think it should be okay. Polyester is pretty durable. Sounds like a fabulous coat! It is! Cranberry red and full skirted. I love it. Thanks. Apologies for all the type-o's; I was tapping in a hurry on my iPad so not great accuracy! An informative post definitely. Ty !! You're blog has been inspirational. You made me realize that one person can change the world by starting with him/herself. Since you're the first blogger of zero-waste that I came across with, some of your practices are still foreign to me. And I try to incorporate the easiest ones to start with. I just bought my first leather shoes (ankle boots) ever and since it's a big investment for me I want to take good care of it to make it last as long as possible. You mentioned that after a month's use, half-soles and rubber toe pads can be attached by a competent cobbler. May I ask what they are and what are their purposes? Thank you very much. Can you explain the details of waterproofing? Do you melt the beeswax and oil together first?